What other principles of perception come from Gestalt theory? Gestalt psychology proposes a series of rules by which the mind organizes perceptual information. These include the rules of proximity, similarity, simplicity, and closure. 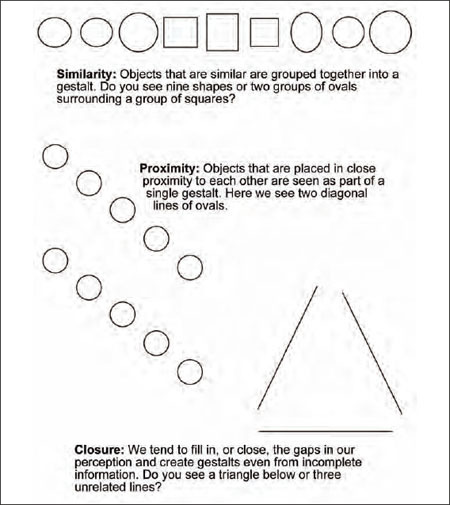 The first two rules suggest that objects that are placed closely together (proximity) or are similar to each other (similarity) will be grouped together into a gestalt. The mind will combine them into a whole. Closure reflects the tendency to fill in the gaps of a gestalt. If we see a circle with sections missing, we will still see it as a circle. Further, the mind will group parts into a whole according to the simplest solution. This graphic explaining Gestalt principles also uses Gestalt principles. Notice how you associate each picture with the text near it. This is an example of proximity.